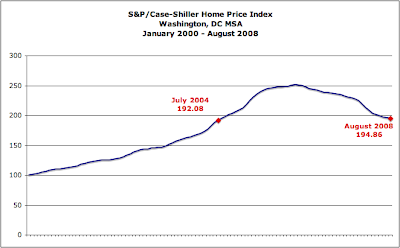 The S&P/Case-Shiller Home Price Indice report for August 2008 was released today. It " shows continued broad based declines in the prices of existing single family homes across the United States, a trend that prevailed throughout the first half of 2008 and has continued into the second half...Once again, the indices have set new records, with annual declines of 17.7% and 16.6%, respectively. However, the acceleration in decline was only moderate in August. The July data reported annual declines of 17.5% and 16.3%, respectively." August's report gives the impression that DC homes prices may have hit bottom. The rate of monthly decline - the acceleration - has lessened and while homes prices were lower YoY, they were not as low as September's YoY pricing data. 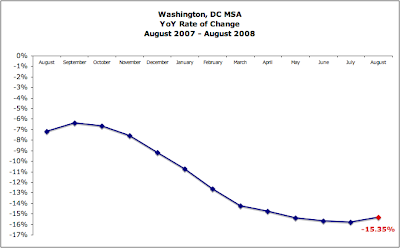 Effectively, the DC area's home price index has fallen to slightly above July 2004, but below AUgust 2004. A 15.35% price decline is painful, but it's nothing compared to other cities. YoY, Las Vegas is down 30.6%, LA down 26.7%, Miami down 28.1%, and SF down 27.3%. Thanks for the information and for this blog Keith. 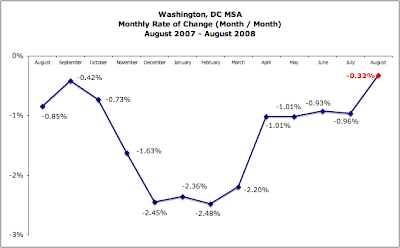 Your blog provides much needed and unbiased information concerning DC House and condo prices. Thanks, I appreciate the kind words. Ditto, multiple times. My wife and I moved to DC this fall, are renting and looking to buy. The information you compile and render simple to access is such a big help. No offense, but I think you are wrong about saying that we have may hit bottom. All the data you list is before the stock market took it's big dip. There are a lot of people who lost $$$ who are not going to risk paying more for a house (and of course there are a lot of people who are now counting on their sell price for retirement funds even more). I think we'll see at least another 5% drop before the spring selling season.